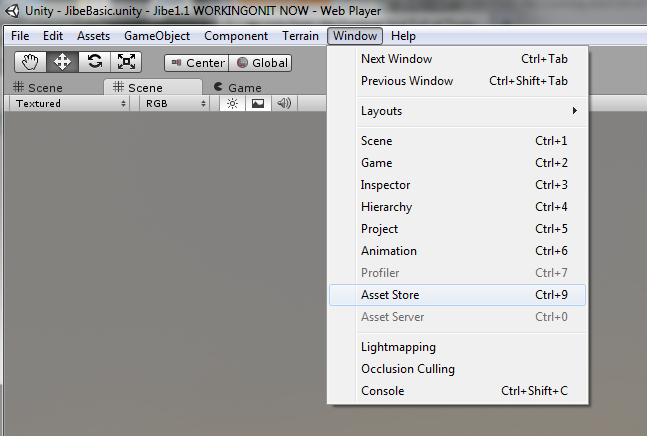 Open your Jibe project in the Unity editor and go to the Unity Asset Store. 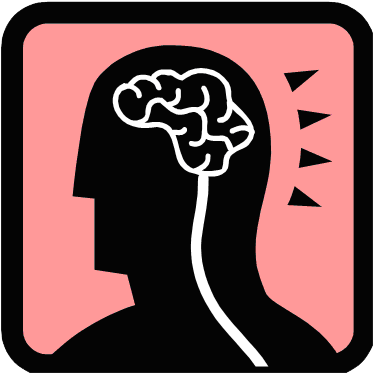 Search the Unity Asset Store for "Memory Puzzle Pack." The Memory Puzzle Pack is made by WyrmTale Games and costs $20. That’s a bargain, considering the fact that the game scripts and objects are fully modifiable. All the game elements will be automatically added to your Project once you buy it. Look for the puzzle Demo scene in your Project window. Double-click on it to load it. Once you’ve got the puzzle Demo scene open in your Unity editor, go the Hierarchy window and find the MemoryMain and Puzzle elements. Select them and hit Control-C to copy both of them. Elements in the puzzle Demo scene you need to copy. Now, double click on your main Jibe scene in your Project folder to open it up, select your Hierarchy folder, and hit Control-V to paste both MemoryMain and Puzzle into your Jibe scene. The Puzzle object will appear in your scene as a black square. In my own example below, I added a wood texture to the object so it looks a bit nicer. Drag it wherever you like. 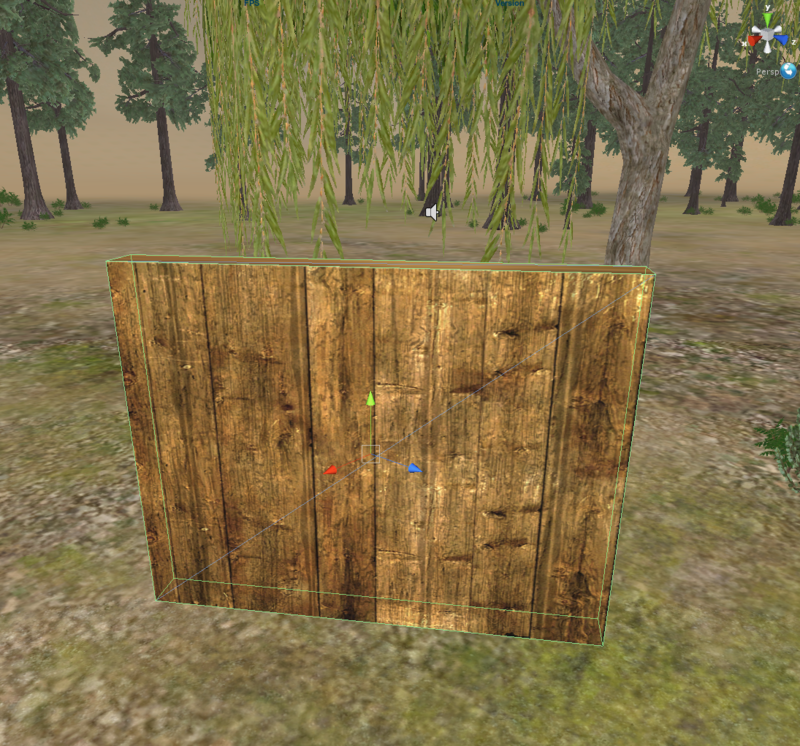 I retextured and placed my Puzzle object under the tree where avatars first appear in my own Jibe world. 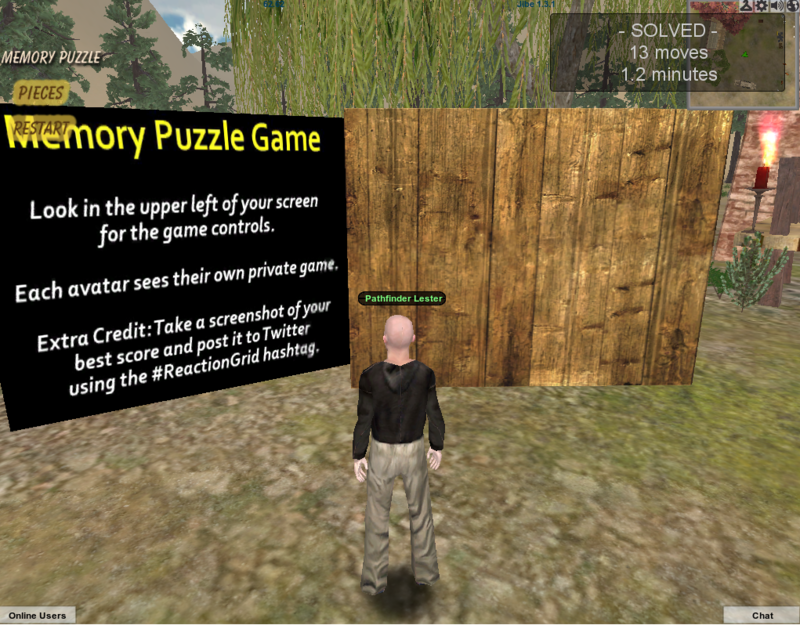 The Memory Puzzle game has some custom GUI elements: a button to change the # of game pieces, a button to reset the game, a score indicator and a graphic header. You can add all of them by modifying the Jibe PlayerCamera element in your Jibe scene. Select the PlayerCamera element in your Hierarchy window. Now go to the Inspector window and drag the DemoMemory script from your Project window into the PlayerCamera object displayed in your Inspector window. DemoMemory script added to PlayerCamera. 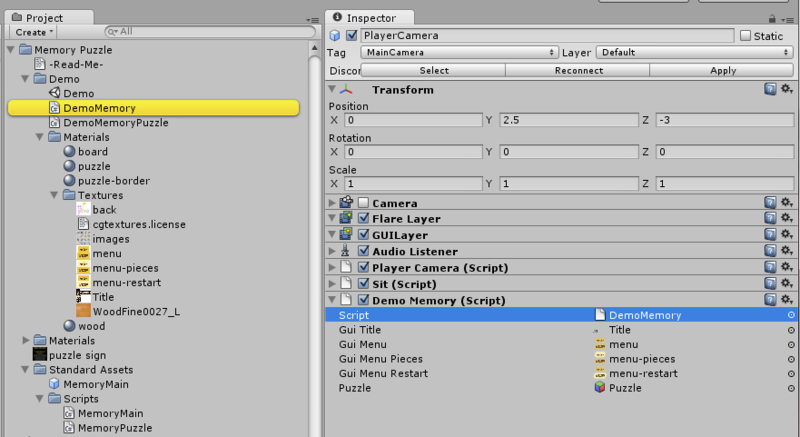 You’ll have to drag and drop the right textures from your Project window into the empty fields in the Inspector window. It’s pretty obvious what goes where. You’ll also have to drag the Puzzle object from your Hierarchy window into the Puzzle field. The above picture shows you how it should all look once you’re done. – Step 4: Play a game! Click the Play button in the Unity editor to log in to your Jibe world and see how it works. Your avatar clicks on cards to flip them over, and matching pairs disappear. Clicking on the Pieces button cycles through different numbers of cards, and clicking the Restart button restarts the game. You can see in my own Jibe world that I’ve modified the game. I added a wood texture to the Puzzle board, placed Jibe logos on the backs of the cards, and slightly changed the GUI Title image so it’s just a small “memory puzzle” bit of text. The entire game is fully modifiable, so you can go crazy and change everything. Don’t like the animals on the cards? Design your own pictures! Just be sure to read the ReadMe file that’s included with the game to learn more about all the different things you can do. The game is set up as a Local Event by default, which means each avatar sees their own private game. With some additional scripting you could probably make it a multiplayer game by using Networked events. And if you’re a clever coder, I bet you could set it up so that scores are saved to a Jibe database. If you’re an educator, perhaps you could even integrate the game with an LMS so that students scores are saved in their LMS records. Visit my Jibe world to see the game in action. And if you integrate any cool games into your own Jibe world, please let me know. I’d love to visit and try them out. UPDATE 6/1/2011: Martijn Segers from WyrmTale Games mentioned in the blog comments that WyrmTale also has a Jigsaw and Sliding Puzzle Pack. More fun games you can pull into Jibe! This entry was posted in Announcements, Avatars, Education, Jibe, Unity3D, Virtual Worlds and tagged avatars, education, game, Jibe, memory, metaverse, online communities, puzzle, ReactionGrid, Unity, Unity3d, virtual worlds by John "Pathfinder" Lester. Bookmark the permalink. a Jigsaw Puzzle packk and a Slider Puzzle pack. Good point about the additional puzzles. I’ll update my blog post and add that information to it.